For all intents and purposes, the season four finale of The 100 is the show’s version of a doomsday clock. As the episode title suggests, Praimfaya is on the way, and that means a face-melting death for anyone that’s not either in the bunker or up in space. For all the talk of life and death stakes throughout the season, this time it’s actually true. 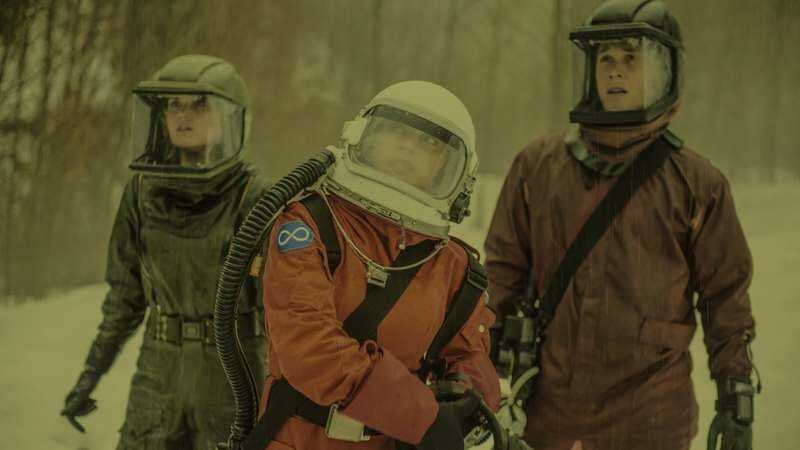 The 100 has always done well with plots that put a tight timeline on some human life-saving plan; this is a show that excels in moments of panic and high stakes, and less so when it’s meandering towards vague moral tests. “Praimfaya” has the high stakes drama that this season finale needed, and an ending that raises some questions about the future while also pushing each of these characters to their physical and emotional limit. 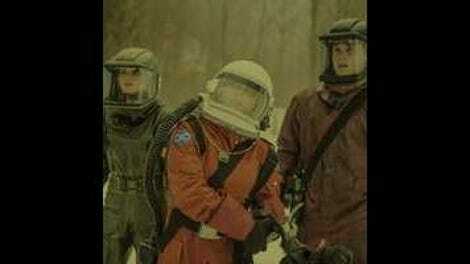 What’s fascinating about “Praimfaya,” when viewed after the fact, is that there’s no story outside of the crew of eight trying to get into space. Sure, there’s an early scene that sees Octavia and Bellamy say goodbye to each other for now, with Bellamy giving his sister the pep talk she needs to step up and lead the various clans in the bunker, but that’s the only one. After Octavia proclaims that by working together they will survive, the episode shifts gears and focuses solely on the rush to get everyone else back to the Ark. That ends up being a smart narrative choice, because there’s enough going on with Clarke, Bellamy, Raven and company that any cuts back to the bunker would have resulted in an episode lacking in the same tension and urgency. Part of the reason the life and death stakes of this episode work where others haven’t is because we spend the entirety of the episode with a single set of characters. That intensifies the connection we already feel to them after nearly four seasons, and that leads to a series of emotional crescendos that wring every last ounce of anxiety from increasingly terrible situations. In a sense, the goal of the team is simple: they have to grab a machine from the woods that will help them with their space trip, and at the same time they have to reroute a satellite that will allow them to turn on the Ark’s power, which is kind of important for things like oxygen and such in space. Of course, nothing is that simple when death by radiation is knocking at the door. Problems arise everywhere: Monty can’t get his hand behind the machine to unplug it, so he has to take off his gloves and expose his hands to the radiation to do it. “Who knew you were a secret badass?” asks Murphy only moments before Monty passes out from the pain and Murphy has no choice but to move on with the machine necessary to save their lives. In that moment, “Praimfaya” reveals why its life and death stakes work so well. Normally, every single moral decision on The 100 must be examined from all angles, and it can be a little tiresome. There’s certainly room for the kind of thematic exploration that challenges our understanding of what’s inherently right and wrong, but too often the show aims for weighty musing and just ends up falling flat. With a tight 90-minute deadline to get the rocket off the ground, there’s no time to have these types of philosophical conversations, and “Praimfaya” is better off because of it. All that’s left is the action, and it’s unbelievably nerve-wracking. Once everyone is back at the ship, including Monty, who’s saved by Bellamy and Murphy, there isn’t much left to do but take off. The only problem: waiting for Clarke to return. She was meant to head out and hook up a device that would reposition a satellite and thus power up the Ark, but she’s nowhere to be found. Eventually, time runs out and the rest of the crew has to take off. Again, there’s no time for discussion; reality set in long ago. That leaves Clarke fighting for her life while also fighting to save her friends, and it’s the most relatable and focused the character has been all season. In that moment where she accepts that she’s likely going to die, climbs the tower, manually repositions the satellite, and allows her friends to get into the Ark, Clarke is the leader she’s long been touted as. It’s her finest moment since the days of Clexa, a true sacrifice rather than the illusion of one. Like any good finale, “Praimfaya” doesn’t just close off the season’s threads with excruciating tension—the scene where they reach the Ark and must turn on the oxygen had me holding my own breath—it also looks toward the future. That’s quite lteral for The 100, as the episode moves from Clarke seemingly dying from the radiation as she gets back to Becca’s lab to six years and 7 days later. Clarke sits on a hillside overlooking what’s left of the wilderness around her. There’s not much. She sends out a radio message to Bellamy, something she’s been doing every day since the Praimfaya came, asking why he’s still not home despite Earth being inhabitable again for more than a year. Then, a ship appears, and it looks like everyone is about to be reunited. But the surprises don’t end there. As Clarke wakes up Madi (where did she come from?) and the two celebrate the end of their isolation, Clarke notices that the ship isn’t the same pod from before. This one is labeled “Elegius - Prisoner Transport.” Is this a new colony now making contact? Are the prisoners the seven that made it to the Ark, including Bellamy? How is Clarke still alive, and why haven’t Bellamy and the others been in contact? And what’s going on inside the bunker? There are a lot of questions to answer, but it never feels like The 100 is just throwing stuff out and seeing what sticks. What’s great about “Praimfaya” is that it feels completely in control. In that way, it’s a fitting end to a season of The 100 that bounced back from the third season’s major missteps. So, the assumption has to be that the Nightblood treatment worked on Clarke, right? Also, she refers to Madi as her “little Nightblood,” so that’s something. While I was pretty excited to have season five go to space, I can’t say I’m upset about the flash forward. After four seasons of relatively streamlined storytelling, The 100 could use the change of pace and time. To everyone that continues to read these reviews, thank you. It’s been a fun season, and a welcome return to form for the show. And thanks to Andrea for filling in when the screener well ran dry and I was stuck spending too much time with a certain Modern Family. Here’s to next season! May we meet again.